Join us as Jack Burkert shares the story of a dynamic industry that unfolded in Baltimore in the second half of the 19th century, one which continued until its gradual disappearance more than one hundred years later. 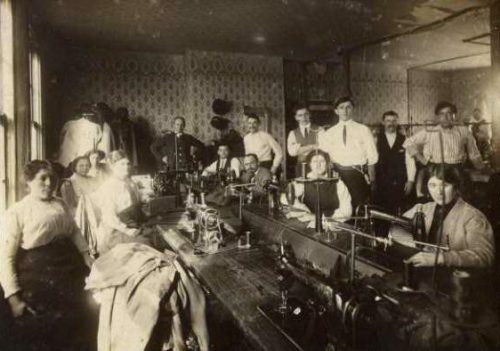 The garment industry, also known as the needles trade, became the industrial power house of the city, employing a major percentage of its workers, and dominating the men’s clothing business throughout the United States. Men’s suits, women’s apparel, umbrellas, hats, shoes, and a myriad of other apparel furnishings came out of downtown factories and to a lesser degree, east side sweatshops. The story of these companies is a story of immigrant tailors building businesses, of newly arrived immigrant workers employed in them (27,000 at one point), and the strife between labor and management as working conditions, wages, working hours and changing times met head on. Styleplus Suits, from the world’s largest clothing factory; Beeler umbrellas, literally thousands produced weekly; Joseph A Banks, from a nephew of the owner, to fabric cutter, to innovator, he and many other owners, workers and associates are detailed in this look at a Baltimore industry that came, thrived and then declined. This program is presented in relation to the Fashion Statement exhibit, on view April 7 – September 15,209. Tickets to public programs include admission to the Museum.